I love a roasted chicken and make one almost every Sunday. For me, roasted chicken is the epitome of comfort food. I truly love everything about the process of cooking a roasted chicken. 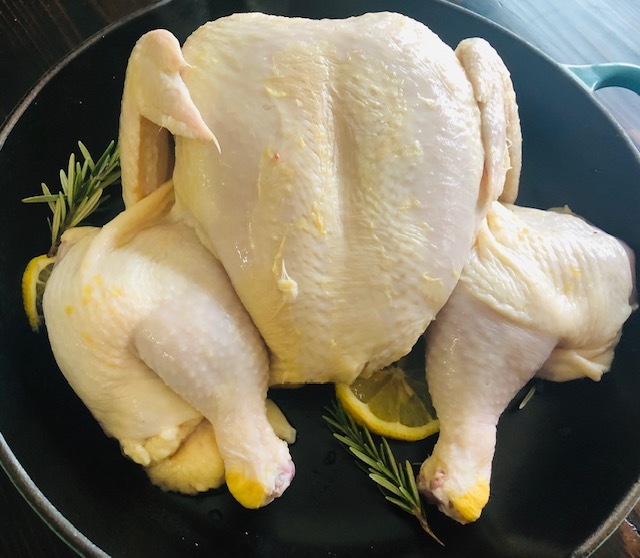 I love from getting the fresh lemons and rosemary from my garden, and best of all I love watching this ugly pale piece of meat turn into a golden, beautiful, delicious meal. Although a whole chicken, is just a whole chicken, you can really do so much with one. For this recipe I am making a lemon rosemary chicken, but I also occasionally like to do a nice cajun rub and roast the chicken, or cook the chicken spatchcock style on the grill. Cooking a roasted chicken is super easy, but also a crowd pleaser, and not nearly as difficult as people think. Give it a try. Bon Appetit! Preheat oven to 400 degrees. Combine butter, olive oil, lemon juice, and rosemary in a bowl. Pat the chicken completely dry with a paper towel. Sprinkle chicken liberally with salt, paprika, and pepper. Using hand, coat chicken inside and out with butter mixture and place in roaster, breast side up and wings tucked under. Insert rosemary sprigs, garlic, and quartered lemons in chicken cavity. Bake for about 1 hour on lower rack, and reduce oven temperature to 375 degrees. Continue to bake for another 30-45 minutes, until juices run clear. Remove chicken from oven and let sit for about 30 minutes before carving. I recommend that you ladle pan juices over your chicken before serving. That’s it! Pretty simple right. Not much prep time to a roasted chicken. You basically season it and pop in the oven for a couple of hours. Easy peasy! Enjoy!